A university student attends a protest at Tehran University while a smoke grenade is thrown by anti-riot police, in Tehran, Iran, Dec. 30, 2017. A wave of spontaneous protests over Iran's weak economy swept into Tehran Saturday, with college students and others chanting against the government hours after hard-liners rallied in support of the clerical establishment. Iran’s interior minister warned that those who “disrupt the order and break the law must be responsible for their behavior and pay the price,” after thousands of anti-government protesters marched for a third day on Saturday. At least two demonstrators were killed during clashes with police Saturday in the western town of Dorud. VOA’s Persian service identified the victims as Hamzeh Lashni and Hossein Reshno after a reporter spoke to the victims’ families. The semiofficial Mehr news agency Sunday quoted a regional government official confirming the two deaths. Video posted to social media purported to show the two victims following the shootings. Other online videos showed thousands of people protesting in several cities throughout Iran, including some attacking government buildings and violently confronting police. There were reports that mobile devices were unable to access the internet for a period of time, but coverage was eventually restored, AFP reported. The uprisings, the biggest and most sustained since the 2009 presidential election protests, were sparked by high food prices. As many as 72 people died in the 2009 unrest after the regime cracked down on demonstrators challenging the re-election of then-President Mahmud Ahmadinejad. Little information about the current protests is available, however, because state-run and semi-official news media have not widely reported on the demonstrations. People protest in Tehran, Iran, Dec. 30, 2017, in this picture obtained from social media. Iran’s telecommunications minister Mohammad Javad Azari Jahromi sent a public message to the CEO of the messaging service Telegram, telling him, “A Telegram channel is encouraging hateful conduct: use of Molotov cocktails, armed uprising, and social unrest.” Telegram responded saying it had suspended the account. Araki’s comments echoed an earlier statement by Senior Vice President Eshaq Jahangiri, who said Friday that some political factions were using the economy as an excuse to criticize the government. State television broadcast images of the protests Saturday, something it rarely does, including acknowledging that some of the demonstrators were chanting the name of Iran’s last shah, who fled the country during the Islamic Revolution in 1979. FILE - In this photo released by the office of President Hassan Rouhani addresses the nation, in Tehran, Iran, Oct. 13, 2017. Rouhani spoke after U.S. President Donald Trump accused Iran of violating the spirit of the 2015 nuclear accord. The chants were seen as a cry against President Hassan Rouhani, who won re-election in May with promises to revive the economy. Iran’s 2015 nuclear deal is seen as Rouhani’s major achievement. The deal, made with the United States and five other world powers, curbed Iran’s nuclear activities in exchange for relief from international sanctions. But economic growth has not followed, and people are struggling to cope with the high cost of living. 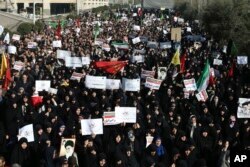 Some protesters have also been heard chanting slogans against Iran’s foreign policies, including its support for the regime of Syrian President Bashar al-Assad. Social media postings, many of which were unverifiable, said protests took place Saturday in cities including Tehran, Shahr-e Kord, Kermanshah and Zanjan. Reports said that in some cities protesters set government buildings and police vehicles on fire. Social media video purporting to be from the city of Mashhad seemed to show protesters overturning a police car and setting police motorcycles on fire. The Mehr news agency posted videos purporting to show protesters attacking a town hall in central Tehran, overturning a police car, and burning the Iranian flag. People protest near the University of Tehran, Iran, Dec. 30, 2017, in this photo obtained from social media. Amateur videos posted online appeared to show clashes at Tehran University, where police forces reportedly used tear gas to disperse protesters. Protesters at the university chanted, “Seyed Ali [Khamenei] Shame On you. Leave The Country Alone,” according to a video sent to RFE/RL’s Radio Farda from the Iranian capital. U.S. President Donald Trump denounced the Iranian government Saturday, tweeting excerpts from his September 19 speech to the U.N. General Assembly. He charged Rouhani’s government, and those before it, have long oppressed the Iranian people. Demonstrations were held in several cities and towns Thursday and Friday in protest against rising prices and the country’s high unemployment rate. Iran’s unemployment rate is 12.4 percent, its economy stagnant and inflation rampant. RFE/RL contributed to this report.